Jamie Dimon: Is There Any There There? Citigroup shares barely budged since Prince succeeded Weill as chief executive officer in October 2003, the second-worst return among the Philadelphia KBW Bank Index&apos;s 24 members in that period. Dimon also trails his peers. JPMorgan Chase & Co.&apos;s stock is up 8 percent since he joined the bank as president in July 2004, compared with the KBW index&apos;s 10 percent advance. So which is more painful: failing to live up to your predecessor, with whom you had a fairly amicable relationship, or failing to live up to your former mentor/father figure, who functionally exiled you to Ohio after you failed to hire his daughter? We&apos;d say the latter. But at this point, what can Jamie Dimon do to pull JPMorgan out of the doldrums? Nothing&apos;s happening right now, unless you count the asset swap with BONY. Dimon doesn&apos;t really have a good story. (Does attempting to do Citi better than Citi does Citi really count as "strategy"?) So what does Dimon do? Option A: More retail expansion, focus on systems problems and cost-cutting. Why Not: Eh, boring. Expansion would have to be selective and under the fed deposit limits, which rules out anything big and splashy unless Dimon goes shopping overseas. Then you have more systems problems. 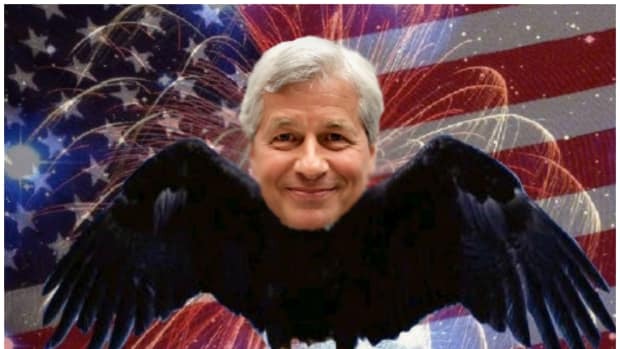 And Dimon will inevitably cut costs but doesn&apos;t like his reputation as such, so that&apos;ll be downplayed. Option B: Merge with Morgan Stanley. Why Not: Not. Gonna. Happen. But we mention it because we&apos;d enjoy the Mack/Dimon turf war. Who could push who out faster and harder? Why Not: Because Dimon would have to start now on the indie film foreshadowing his future insider trading activity and cost-cutting has eliminated those little red pens you need to do storyboarding. Option D: Have Jimmy Lee repeatedly assert to the press that Jamie Dimon is a "rock star." Why Not: Already did that. The stock stayed put.